In the words of Trenton Tye (aka The Blacksmith), why don’t these dumb things die? 'Architects & Engineers: Solving the Mystery of WTC 7,' the 15-minute documentary by AE911Truth, has reached the 1 million views milestone on YouTube. Narrated by actor, Ed Asner, the video decimates the official account of Building 7's destruction on 9/11. 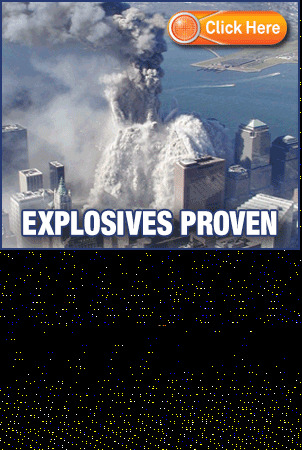 Many people will have their attention on 9/11. 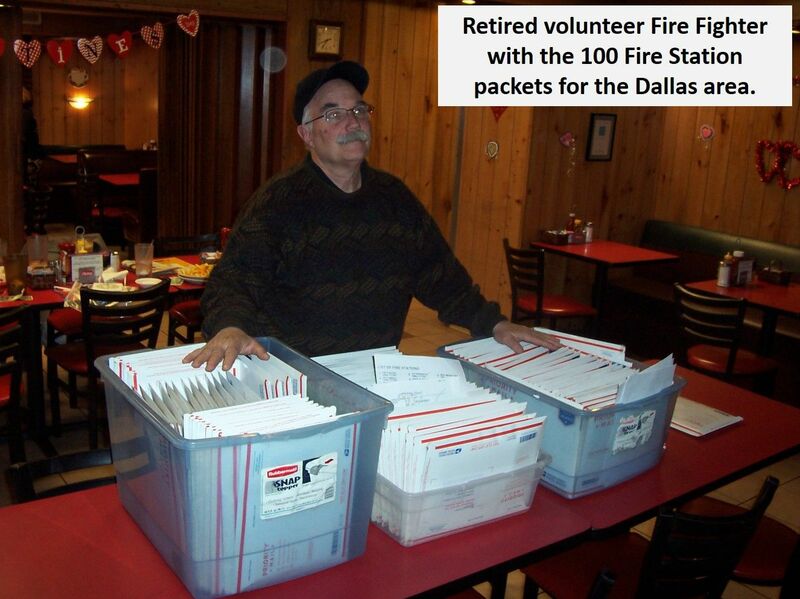 Now is a great time to send a short email. ANYONE can do this and reach many people. Send to politicians, public officials (many will be holding 9/11 Memorials), members of groups who will be going to the 9/11 Memorials, ministers, etc. Taken from 9/11/01 - This is a very important 15 minute video clip. The best! 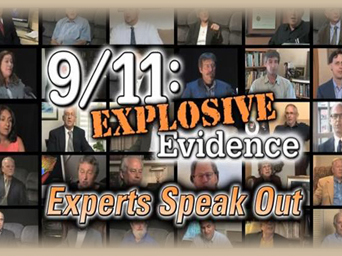 WORLD PREMIERE OF DOCUMENTARY–9/11: Explosive Evidence – Experts Speak Out — FINAL EDITION! 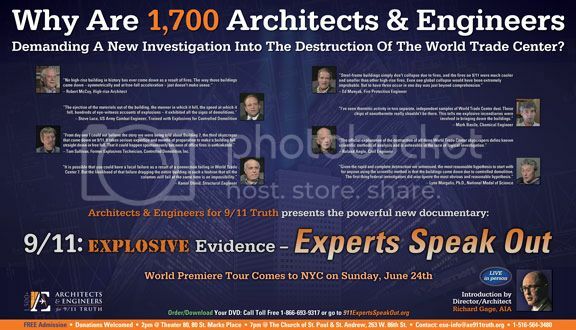 No Lies Radio News is proud to announce that we will be live video streaming Architects & Engineers for 9/11 Truth landmark documentary, 9/11: Explosive Evidence – Experts Speak Out. The Architects & Engineers for 9/11 Truth have already taken this film on the road on their Whirlwind World Premiere Tour across the US to over 30 cities where AE911Truth founder and CEO, Richard Gage, AIA, the director, has shown the film, personally introduced it, and has answered the tough questions that are always raised. We are thrilled to inform you that the World Premiere Tour of AE911Truth’s new documentary, “9/11: Explosive Evidence – Experts Speak Out,” is coming to New York this Sunday, June 24. To show our support for the release of this groundbreaking film and use it as an opportunity to educate hundreds of thousands of New Yorkers, the Remember Building 7 campaign has contributed a small portion of the $85,000 we raised during the 10th Anniversary to place a double full-page ad in the center fold of this week’s Village Voice. This massive ad featuring quotes from eight architects, engineers and other technical experts will be seen by 250,000 to 300,000 New Yorkers over the next seven days, with each impression costing less than 3 cents. The size, beauty and placement of the ad are sure to make anyone who opens the paper notice it, and the powerful quotes will make all but the most resolute adherents of the official story begin to question what we’ve been told about 9/11. UPDATE: Chris Sarns and David Chandler will be joining us also. This is a live, two hour Question and Answer session--Your opportunity to ask Richard Gage questions and hear him bring everyone up to date on what AE911TRUTH has accomplished recently. Richard joins us on the first Sunday of each month. Paltalk is a cool way to interact with other 911 activists through voice and text chat. You can also split off from the main room and engage in private chat sessions, as well as share files and video.